Small, mountainous, and completely landlocked by South Africa, Lesotho depends on a narrow economic base of textile manufacturing, agriculture, remittances, and regional customs revenue. About three-fourths of the people live in rural areas and engage in animal herding and subsistence agriculture, although Lesotho produces less than 20% of the nation's demand for food. Agriculture is vulnerable to weather and climate variability. The Kingdom of Lesotho, also known as the “Mountain Kingdom”, is a small landlocked country entirely surrounded by South Africa. It is very mountainous, with more than 80 per cent of the country at 1,800m above sea level; two of South Africa’s principal rivers rise in these mountains. Lesotho’s main natural resources are water and diamonds. The climate is temperate with dry, cool winters and hot, wet summers. Lesotho has two main mountain ranges – the Drakensberg and the Maloti ranges – both running north–south from the northern high plateau. The highest mountain in southern Africa is Thabana–Ntlenyana (3,842 metres) in eastern Lesotho. The land descends to the west to an arable belt, known as the lowlands, where the capital is situated and two-thirds of the population live. The country is well-watered in a generally dry region, the Orange river and its tributary the Caledon both rising in Lesotho. The climate is temperate with well-marked seasons. Water and diamonds are Lesotho's only significant natural resources. Water is Lesotho´s most abundant resource as well as being the country´s largest single source of foreign exchange earnings since the implementation of the Lesotho Highlands. 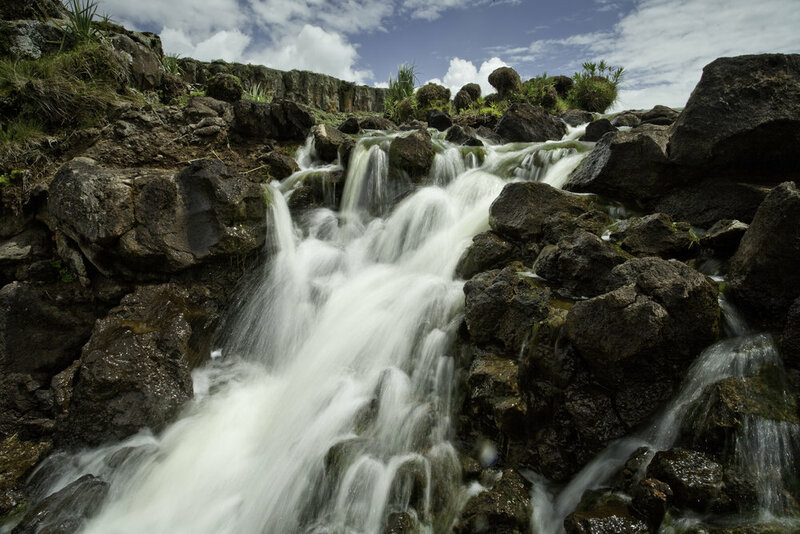 One of Southern Africa´s principal water catchment areas, rainfall together with winter snowfalls provides an estimated 5.5 billion cubic meters of water annually and renewable groundwater resources of some 340 million cubic meters per year. Supplying the Republic of South Africa with millions of cubic metres of water per year, the Lesotho Highlands Water Project (LHWP) is the largest and most ambitious long-term water transfer scheme of its kind on the continent, and has done much to develop the region’s water supply. Diamonds are produced in Letšeng, Mothae, Liqhobong and Kao mines. The sector is a major contributor to the exports of Lesotho. Lesotho’s biggest and most prolific mine, Letseng, consists of two kimberlite pipes. Today, Letseng is the world’s highest diamond mine at 3,100 meters above sea level, and is famous for producing huge diamonds, which gives it the highest dollar value-per-carat of any diamond mine. It is owned by Gem Diamonds and the government of Lesotho. Lesotho depends on a narrow economic base of textile manufacturing, agriculture, remittances, and regional customs revenue. About three-fourths of the people live in rural areas and engage in animal herding and subsistence agriculture, although Lesotho produces less than 20% of the nation's demand for food. Agriculture is vulnerable to weather and climate variability. Lesotho is a country of 2.2 million people and has had to struggle since Independence in 1966 to maintain its sovereignty in the face of diverse political and economic adversities. Although classed as a Least Developed Country, Lesotho has made substantial progress in many areas. The overarching development goal of the country’s Poverty Eradication Strategy (PRS) is to provide a broad-based improvement in the standard of welfare for the current generation of Basotho, without compromising opportunities for future generations. Lesotho has water as its most important natural resource, second to her people. The ownership of all water within Lesotho is vested in the Basotho Nation. The government is committed to ensure effective and efficient management and development of this resource in order to maximize socio-economic benefits. It aims to achieve this objective in an equitable manner without compromising the sustainability of vital environmental systems. Proper planning, conservation, development, and management of water resources require a shared vision and ownership. Paramount on Lesotho’s development agenda is the alleviation of poverty. Properly focused programmes should allow particularly the poor to have access to potable water supply and improved sanitation facilities. Conserving and preserving the mountain ecosystems—the main natural resource—to sustain people and animals will also be key to harnessing that economic potential to benefit all of Lesotho’s people. Lesotho has embraced the idea of Public-Private Partnerships (PPP) over the last decade as a means of improving public services. Maseru City Council has led the way, working with the UN Development Programme to identify projects that would benefit from private sector involvement. PPP arrangements have been put in place in the capital for waste facilities management, outdoor advertising and road maintenance.